The term "farmhouse" in brewing is one that can get purists' knickers in a twist. Some claim that unless you're brewing on a farm, using ingredients from the farm, then you can't make farmhouse ales, even if your inspiration and intention is to recreate historic beer styles that are often bundled together under that banner. Few could doubt that Costa Nikias at Melbourne's La Sirène takes inspiration from a particular time and place in beer's history: he obtained his original yeast strain from a village in northern France, many of his beers are saison variants, he's been developing a series of spontaneously fermented beers and his house yeast strain now features some of the wild yeasts found in the air around his brewery. Yet, while the atmospheric factory unit where he brews his beers is adjacent to parklands and a creek, it's also on a small industrial estate next to a railway line and not far from the Eastern Freeway; in other words, it's not a farm. In recent times, he's been using the tag "urban farmhouse brewery", apparently one that The Crafty Pint originally coined in relation to the brewery (we talk and write so much it's hard to remember much of what is transmitted...). Now that term has made it into the name of a beer. And, if you wanted to encapsulate what the twin elements of the name meant in a single beer, it could well be this. 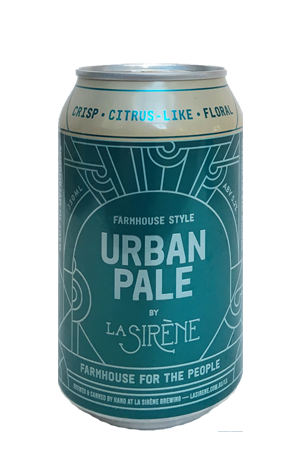 It's a farmhouse style ale, brewed with the brewery's house yeast strain, then given not one but two contemporary twists: it's hoppier (at least in terms of aroma and flavour) than any other La Sirène brew to date and comes in a (typically elegant looking) can. As for what's inside, it's a hazy, pale yellow beer awash with tropical, citrus and orange peel aromas and flavours that might initially lead you to believe it's a straight down the line pale ale. Then the earthy, peppery and drying effects of the house yeast come into play to remind you it's a La Sirène beer. Costa wants people to drink it from the can as it seems to present as more sprightly and cuttingly refreshing that way; should you prefer a glass, it broadens the palate and brings the yeast's characters more to the fore. Either way, we can envision many craft beer lovers filling their picnic hampers and festival Eskies with this in the coming months.